Welcome to Birding in Maricopa County. This is an online guide to the birds and birding hotspots of Maricopa County, Arizona. 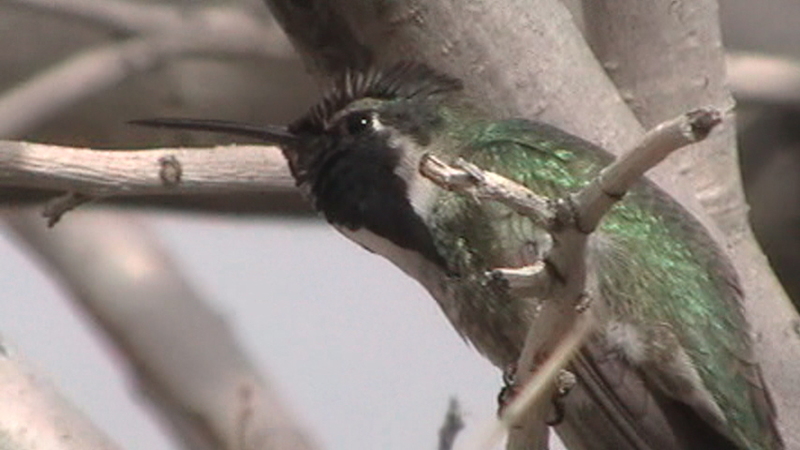 This guide's hope is to interest birders with Maricopa County's birding. Maricopa County is a very large county with a lot of different habitats to support a wide variety of bird species. This primarily thought of county as “desert only” actually has a little bit of everything. Maricopa is the 15th largest county in the United States by area, and the 5th largest in Arizona (Coconino, Mohave, Apache, and Navajo are larger). Habitats in Maricopa County range from the hottest deserts to forested mountains that reach above 7000 feet. Good birding opportunities present themselves here at all times of the year. In Maricopa County, you will see a great variety of desert birds that only live in the southwestern United States, as well as a variety of different western birds that are seen in the western part of the United States throughout the different habitats of the county. The goal of this guide is to present the best places and locations to bird in Maricopa County, and what birds the birder is likely to find at each location or "hotspot". This guide is meant to bring the county to life, and is arranged by thirteen different areas. I have traveled to every location on this guide and researched the information provided, and have completely taken every picture of the locations and birds. The different areas each have a list of different birding locations in them, where multiple locations may be visited in one day in a given area. Each location has a description of it's habitat and birdlife, as well as maps and directions, birding tips, pictures of both the scenery of each sight as well as photographs of the birds taken on site. This guide's purpose is to meet the needs of all birders who want to bird in Maricopa County, as it can aid beginning to experienced birders who want to find different birds or locations to bird at. Whether you want to have a simple and easy birding outing or a difficult hike in the wilderness to find birds in remote areas, this guide will bring you locations of every difficulty. This guide is also designed for birding throughout the calendar year. Birding areas will always include the very best places in the county throughout the year, but there are also a number of "side spots" included. Side spots include locations that are smaller but may have great potential throughout the year, with an example being different ponds to check during shorebird migrations. Maricopa County has a drastic number of great locations that are under birded and rarely explored, which is one of the huge reasons I chose to write and illustrate this guide. I want more people to explore these areas, where they won't be disappointed! I liked the idea of publishing an online birding guide for a number of reasons. One being, I've always wanted to publish my own book, especially one like this designed to help people find things. I don't have the money for that, so this is the closest I can get! I want to share Maricopa County with everyone through my eyes as I see it. Two, I think birders deserve to have information about birds and birding locations readily accessible. Although this guide isn't in print, at least birders can access it free of charge for their own enjoyment. Third, I'm thinking more about myself in the long run! I hope you will explore Maricopa County more in depth by using this guide, and find me new birds for my Maricopa County list. No kidding on that one! There is no right or wrong way to start exploring Maricopa County. Pick a birding location that interests you, and get started on birding. Take time by reading this introductory section to get familiar with what to expect when Birding in Maricopa County. Before you attempt to go out into the field, take some time to prepare your trip. Arizona has two weather time frames in general: summer or winter. Weather is a big factor to planning trips. Pay attention to any weather forecasts. Birding in winter months will always be easy and can be done during anytime of the day. Some days will be very brisk and cold and will require you to dress in layers. Comfortable weather in Maricopa County lasts generally from November to April. Birding in the summer months are a lot different in Maricopa County. There are only a few hours in the summer mornings that are comfortable for birding before the temperatures rise to 115 degrees or more. Being at your destination before sunrise is the only way to go here in the summer. Hot months go from mid-May until they finally start to cool down in late October. The higher elevation mountains with pine and oak forests are the only comfortable bet to visit for a day trip during the summer months. 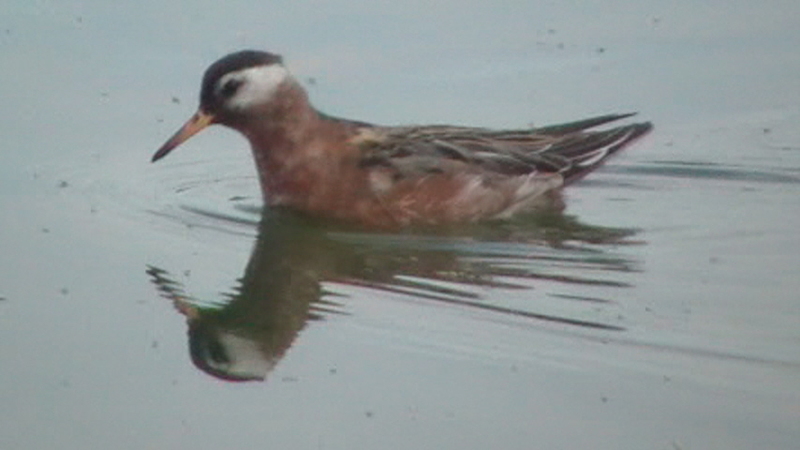 Another key factor to planning a trip is of course the question of what birds you are in pursuit of. By reading the overviews on this guide to the different birding areas and locations, information is given on what birds are likely to be seen at each site throughout the year. For the best results, visit the spots during the suggested time frames. The Arizona and New Mexico Birding Listserv is a great way to know about rare birds in the area that have been reported, whether it's in Maricopa County or anywhere else in Arizona. The most important items to bring with you on any birding outing are food and water, as well as a cell phone device in case of an emergency. Drink water regularly throughout the outing, even if you aren't thirsty. Hydration is key when birding here, especially in the summer months. Sunscreen, a first aid kit, and bug repellent are other important items. And of course don't forget your binoculars, cameras, and spotting scopes! Birding is an activity meant to be enjoyed for fun, meaning it should be enjoyed with the presence of others in mind and the welfare of the birds. There are plenty of right and wrong ways to bird. First and foremost, if we enjoy birding, we should respect the birds and their habitat. Birds are sensitive animals, and a lot of species are restricted to limited habitats. If we are in the habitat of these species (or any species in general), we should go into that habitat and and leave the habitat like it was before we came to the area. A lot of birds are very territorial. Refrain from playing tapes to breeding bird species. Playing tapes a lot of times will distress birds and cause them to leave their nests, and may threaten a bird's health. In some situations playing tapes is ok, such as the song or call to bring in an accidental migrant for documentation purposes. Even then, refrain from playing tapes too much. If the bird comes in once to the tape and the looks are good enough, then refrain from playing it any more. 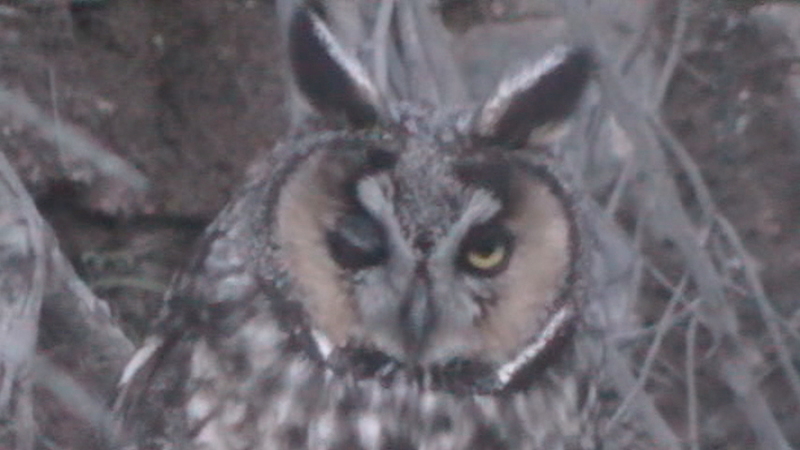 Tapes are often used for owling by birders. Same scenario, if an owl answers back once, then let that be good enough. Don't overplay tapes ever. If viewing nesting birds or species that are very shy, keep all views at a comfortable distance for the bird. If you can tell with decent views what nesting bird is actively on a nest from where you are, then let that be your boundary for distance. The more we follow these rules, we'll have more birds to look at in the future! Don't ever overcrowd a certain bird to the point where it gets freaked out of people and leaves the area. 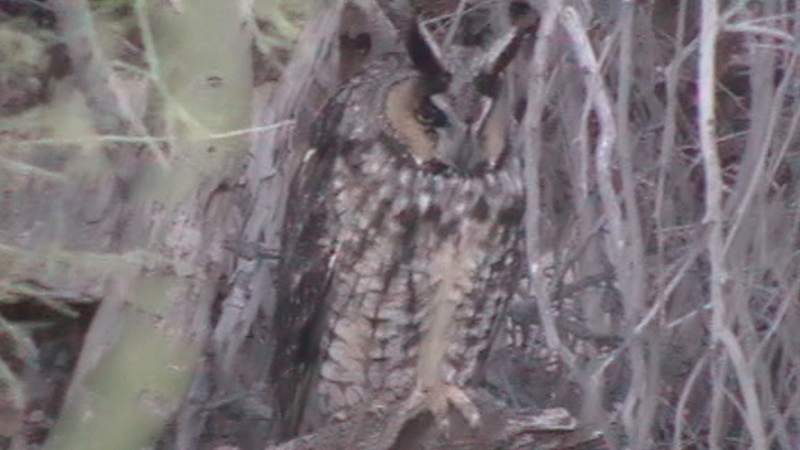 I'll use Long-eared Owls as an example. These birds are very shy and hard to approach, and like to be off to themselves. If viewing a Long-eared Owl without scaring the bird up first, enjoy the looks while it is there and refrain from following it around too much. Be sure to not bring the presence of a sensitive bird like a Long-eared Owl to public attention, as well as specific nesting spots, primarily for raptors. A lot of birding areas have trails in them that go throughout the area, where trail heads encourage people to stay on the trail. The trails where made for a reason, be sure to stay on them and not disturb the habitat. Another category of proper behavior comes with the respect of property. There are places everywhere on earth where there is private property, as in Maricopa County there are a ton of places that are private and trespassing is forbidden. We all get tempted to trespass when the habitat looks great or if we see our dream bird fly into that property, but we need to avoid doing that at all times. This often includes Indian reservations, city properties, and land owned by farmers. As birders, we must maintain a good reputation on those around us by obeying those who have rights to property. There are times often when landowners give us permission to bird on their property. If they do so, be on the best behavior possible to maintain a good reputation for yourself and others as birders. This may even lead to these landowners taking up birding interest for themselves, or they may even grant all birders permission to enter their property. Good behaviors like this can be thought of as opportunities for us to be a respected community of people, where in some cases people will like to have us around! Another example is by following posted rules by the owner in a birding area, such as a state park, preserve, city park, or on a highway. Don't visit parks during off-hours or block traffic to look at a bird. Birders need to yield the right of way to others in certain areas and put these rules and regulations before birding needs. These's ideas came from the American Birding Association's Principles and Code of Birding Ethics, which I follow as birder and encourage you to do the same. Read the full code of birding ethics on different ABA publications. There are a lot of hazards within Maricopa County that people need to be informed about before going out in the field. Besides the heat and dehydration (the overall worst hazard! ), there are other hazards you will encounter on trails that will need to be avoided, and this section will explain those different hazards. In this guide, a lot of the hotspots and locations listed require hiking in remote areas or through a variety of habitats. A lot of potential hazards come from animals. 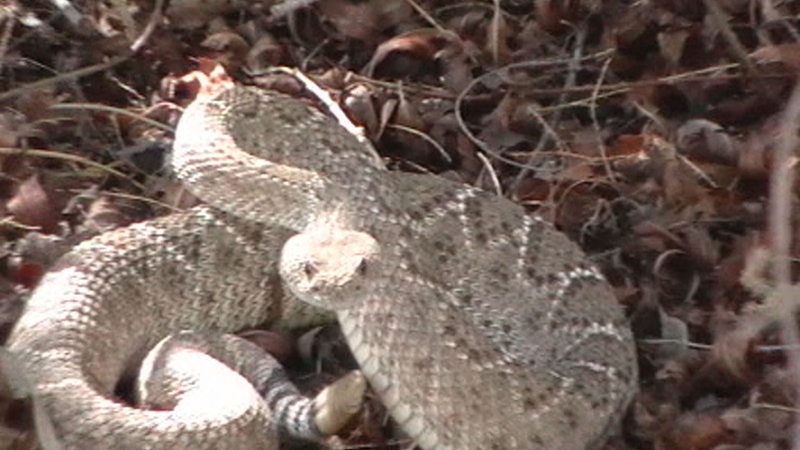 On any warm day in the area, it is always possible for a rattlesnake to be encountered. Pay close attention to where you step, walk, or sit. Most snakes give loud and obvious warnings of their presence, but don't always take that for granted. This area is also home to scorpions and Gila Monsters. Watch where you put your hands with these critters as well, as scorpions are commonly under rocks. If you have curious kids with you when you are birding, closely monitor their activity. Make sure they aren't lifting rocks up or looking under loose or fallen objects where these venomous animals may be. Another serious hazard are Africanized bees. These bees may build their hives in any tree. Pay close attention especially where bee activity is high, as these nests are commonly seen in the holes of trees such as sycamores. Bee careful! Mammal wise, Maricopa County is home to a high population of Mountain Lions. Although it is very rare, these powerful hunters occasionally attack people. If you encounter a Mountain Lion, do not run. Raise your hands in the air to show the lion how big you are. The county is also home to a significant number of Black Bears in the higher and forested elevations. If in these areas, keep in mind a bear may be nearby. When a bear is encountered, never run either, but back away slowly. If camping in these elevations, keep food locked up and secure from curious bears. Bears are strong enough to break any car window, so keep food scents secure. Also keep in mind that coyotes, bobcats, and javelina are in the area and are rarely aggressive toward people, but these animals may attack if threatened or some of them may carry rabies. Avoid any skunks or raccoons you may see in daylight hours or acting unusual, as they are the more common carriers of rabies. If an animal bites you, see a doctor immediately. As mentioned, attacks from these mammals are very rare. Your probably more likely to be struck by lighting or even attacked by a dog than have any of these mammals attack you. There are many hiking hazards as well. A lot of the trails are rocky, where someone can easily slip and get hurt. Also prepare for a vehicle breakdown, especially when driving on any backcountry or forest roads. Having food and water with you for this hazard is very important as well. Another danger is of course suspicious people. Lock your vehicle and keep your valuables out of sight. Avoid going places by yourself, especially in areas where there are signs of gang activity. The number one rule to avoid a hazard is to travel in groups. If you are going out birding alone, please let someone know where you are going. Take a cell phone with you in case of an emergency. Too many stories take turns for the worst, so please do what you can to avoid getting hurt. I strongly encourage that you keep the hazards mentioned above in mind. I don't encourage anyone to travel alone in areas that are remote. Keep your eyes out for hazard information throughout this guide under the different birding locations. As mentioned above, Maricopa County is extremely variable with it's habitats, giving the county a diverse selection of birdlife. This category of the introduction will explain the different habitats and what birds are expected to be seen at those habitats. Lower Sonoran Desert Habitats: The Lower Sonoran Desert is the main habitat makeup of Maricopa County. It ranges from the lowest elevations to about 4000' and is actually quite diverse with a variety of different vegetation, trees, and plants. The picture below shows an example of the Lower Sonoran Desert. This habitat is open and is made up of creosote flats with scattered chains of mesquite and paloverde trees. Here in this habitat is where one will find Le Conte's, Crissal, and Bendire's Thrashers on a year round basis. 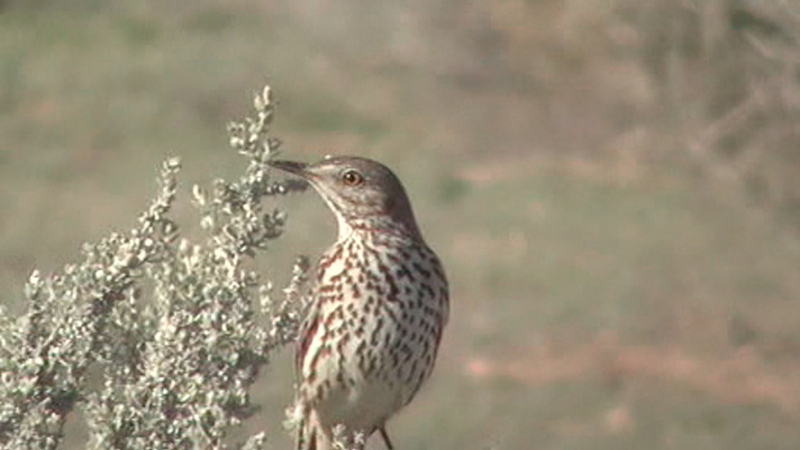 Sage Thrashers are common in migration and Sage Sparrows are abundant in the winter months. Other birds characteristic of this habitat include Gambel's Quail, Ladder-backed Woodpecker, Verdin, Black-tailed Gnatcatcher, Abert's Towhee, and Black-throated Sparrow. This second picture below shows another good example of the Lower Sonoran Desert habitat. The habitat here is filled with tall saguaro cacti with various smaller cacti such as teddy bear cholla. Desert trees and shrubs are numerous in the habitat make up which include ironwood, paloverde, and mesquite trees. Canyons, desert reservoirs, and riparian habitat can often be found in midst of this habitat combination. Birds to watch for in this habitat include Gambel's Quail, Harris's and Red-tailed Hawks, American Kestrel, Prairie and Peregrine Falcons, White-winged Dove, Greater Roadrunner, Elf, Western Screech, and Great Horned Owls; Lesser Nighthawk, White-throated Swift, Anna's and Costa's Hummingbirds, Gila and Ladder-backed Woodpeckers, Gilded Flicker, Say's Phoebe, Ash-throated Flycatcher, Loggerhead Shrike, Bell's Vireo, Verdin, Cactus, Rock, and Canyon Wrens; Black-tailed Gnatcatcher, Curve-billed and Bendire's Thrashers, Phainopepla, Lucy's Warbler, Abert's and Canyon Towhees, Black-throated Sparrow, and Northern Cardinal. Upper Sonoran Habitats: The Upper Sonoran Habitat can be found at elevations anywhere from 3500' to 6000'. Vegetation in this habitat zone include juniper covered hills, chaparral habitat (manzanita, juniper, agave, and scrub oaks), and pinyon pine trees. The photo below shows chaparral habitat, which in this photo shows manzanita, juniper, and scrub oaks. This habitat often has to be birded from a trail or road, as navigation is very difficult through the vegetation which is very dense. Key birds here are Black-chinned Sparrow, Gray Vireo (where there are junipers), Spotted Towhee, Western Scrub-Jay, and Scott's Oriole. Also seen here are Gambel's Quail, Western Kingbird, Bushtit, Crissal Thrasher, Phainopepla, Rufous-crowned Sparrow, Canyon Towhee, and Bullock's Oriole. Other species that favor this habitat may include Golden Eagle and a variety of wintering species. This second photo below shows a good example of juniper habitat, which is another indicator of Upper Sonoran habitat. In juniper dominated habitat, breeding species to watch for include Red-tailed and Zone-tailed Hawks, Ladder-backed Woodpecker, Cassin's Kingbird, Gray Vireo, Western Scrub-Jay, Bridled and Juniper Titmouse, Verdin, Bewick's Wren, Phainopepla, Lucy's Warbler, and Rufous-crowned Sparrow (in areas where there are brushy slopes). Winter is amazing and will bring abundant birdlife in season. Wintering species include large numbers of Cedar Waxwing, American Robin, Western Bluebird, Northern "Red-shafted" Flicker, Townsend's Solitaire, Hermit Thrush, as well as Sage Thrasher, Mountain Bluebird, Hutton's Vireo, White-breasted Nuthatch, Brown Creeper, and occasionally a Fox Sparrow. Transition Zones: Transition Zones are the forested areas of the area and are met when ponderosa pine, oak, and Douglas firs are found. This habitat is rather scarce on a county level, but good habitat does exist, mainly in the northeastern part of the county in the Mazatzal Mountains. This habitat in Maricopa County usually can be found at elevations ranging from 6000-7000'. Several forested drainages in midst of shady canyons in transition zones go well below 6000', but include an amazing combination of ponderosa pine, oak, Douglas fir, and sycamore trees. This combination is similar to the canyons of southeastern Arizona. Birdlife to watch for in transition zones during breeding seasons include Golden Eagle, Coopers, Red-tailed, and Zone-tailed Hawks; Northern Pygmy-Owl, Broad-tailed Hummingbird, Acorn and Hairy Woodpeckers, Western Wood-Pewee, Ash-throated Flycatcher, Western Scrub and Steller's Jays; Plumbeous and Hutton's Vireos, Violet-green Swallow, Red and White-breasted Nuthatches, Bewick's and House Wrens, Western Bluebird, Hermit Thrush, Olive, Black-throated Gray, and Grace's Warblers; Painted Redstart, Chipping Sparrow, Hepatic and Western Tanagers, and Black-headed Grosbeaks. Red Crossbills breed occasionally during winter months. Dusky-capped Flycatchers have recently been found breeding in these areas, and Mexican Jays are irregular visitors, often in large flocks. Other irregular species to watch for include Band-tailed Pigeon, Mountain Chickadee, and Pygmy Nuthatch. Migrations are interesting in transition zones, where one may get lucky and find a Red-faced Warbler and other mountainous species on the move. Three forest owls-Spotted, Northern Saw-whet, and Flammulated, are worth checking for. Riparian habitats are found where water comes into contact with land. These habitats are found where specific trees and plants grow along places where there is running water such as rivers, steams and creeks, drainages, and washes. This habitat is key for finding a lot of the birds in Maricopa County, as it is great habitat for breeding, migrating, and wintering birds. Migrants will flock in large numbers to any place where there is running water and good tree cover. Riparian habitat is found though out Maricopa County from low desert elevations up to the transition forested zones. In the Lower Sonoran Zones, riparian habitats are highly made up of cottonwood and willow woodlands, as well as mesquite bosques. There are a lot of different locations in Maricopa County with these riparian habitats. Excellent examples of these habitats are found in locations such as the Salt, Verde, and Hassayampa Rivers. The willows and cottonwoods continue somewhat into the Upper Sonoran Habitat but are more limited as the elevation gets higher. Arizona sycamores, ash, and walnut trees represent the riparian habitat more in the medium to higher elevations. Good examples of riparian habitat in medium to higher elevations include places like Sycamore Creek and a few drainages at Mount Ord and Slate Creek Divide which have good sycamore habitat. The photo below shows an example of riverside willow and cottonwood riparian habitat in the Lower Sonoran Desert elevations. Mesquite bosques are often found in midst of the cottonwood and willow stands. The Lower Sonoran Desert is always surrounding the riparian areas, where the regular desert species may be seen near the riparian habitats or visiting the area for a drink. Breeding birds that favor these dense riparian habitats include Bald Eagle, Cooper's Hawk, small populations of Gray and Red-shouldered Hawks, Yellow-billed Cuckoo, Great Horned and Western Screech Owls, Black-chinned and Anna's Hummingbirds, Willow, Vermilion, Ash-throated, and Brown-crested Flycatchers; Bell's Vireo, Phainopepla, Lucy's and Yellow Warblers, Yellow-breasted Chat, Song Sparrow, Summer Tanager, Blue Grosbeak, Bullock's and Hooded Orioles, Lesser Goldfinch, and sometimes even Lawrence's Goldfinches. This habitat will attract an amazing variety of birds during migration and winter. Sections of the rivers and washes are good for viewing different waterbirds, such as waterfowl, herons, and shorebirds. This second photo below shows riparian habitat dominated by sycamores, which sycamores are found from 3000' to 6000'. They are more highly concentrated at elevations between 3 and 4000', where they are usually the most dominant riparian tree. At the higher elevations of the Lower Sonoran habitats, sycamore riparian habitat will mix in with cottonwood, willow, and mesquite habitat. Where sycamores are the most dominant tree, surrounding habitats usually include chaparral and juniper covered hills which show Upper Sonoran habitat. Birding in riparian areas in medium elevations will have good birding adjacent to this habitat with the surrounding chaparral and juniper hills. Steep slopes and cliffs often surround sycamore riparian habitat, forming canyons. Birdlife in this setting includes nesting Common Black and Zone-tailed Hawks, Elf Owl, Common Poorwill, Brown-crested Flycatcher, Cassin's Kingbird, Yellow Warbler, Yellow-breasted Chat, Summer Tanager, Blue Grosbeak, and Bullock's and Hooded Orioles. These habitats are all aquatic and provide good birding throughout Maricopa County, and most of them are man made. There aren't any natural reservoirs in Maricopa County. Demonstration and constructed wetlands, park ponds, and recharge basins are also man made. Native riparian habitat is often planted in midst of these areas, or is naturally nearby. All reservoirs have natural surrounding habitats. Constructed wetlands and ponds have man-made ponds and basins with riparian habitat built and established. Gilbert Water Ranch is a perfect example, as well as Tres Rios Wetlands. Recharge basins and shallow ponds attract shorebirds in high numbers, such as the Glendale Recharge Ponds. These habitats will provide the best viewing opportunities for most of the aquatic birdlife in Maricopa County. Throughout these habitats look for different geese, ducks, loons, grebes, pelicans, cormorants, herons and bitterns, Ospreys, Bald Eagles, Northern Harriers, rails, coots, a variety of shorebirds, gulls, terns, and Belted Kingfishers. Breeding examples include Black-bellied Whistling Duck, Least Bittern, Great Blue Heron, Clapper Rail, Common Gallinule, American Avocet, and Black-necked Stilt. Fields and Farmlands are an important habitat in Maricopa County and are a big factor for seeing a variety of migrating and wintering birds that favor grassland habitats. Wintering raptors are in abundance here. This habitat includes agricultural fields that may be flooded with water at any given time. If the fields are flooded during irrigation, they may be a good place to observe herons, egrets, waterfowl, and shorebirds. They may also include fields with different grass lengths, or they may be fields that are completely bare. Alfalfa fields are a favorite among different species in these habitats. Farmlands have feedlots and pens used for feeding cattle that are also favored by different bird species. This is where one may find a rare Ruddy Ground-Dove or large flocks of feeding blackbirds. Sod farms in the county also provide great habitat for migrating and wintering species, such as Chestnut-collared and McCown's Longspurs, or perhaps a rare Lapland Longpur. Species to watch for in these habitats during the year include geese, herons, egrets, Black and Turkey Vultures, Osprey, Bald Eagle, White-tailed Kite, Northern Harrier, Swainson's, Red-tailed, and Ferruginous Hawks; American Kestrel, Merlin, both Prairie and Peregrine Falcons, Sandhill Crane, Long-billed Curlews and other various shorebirds in flooded fields, White-winged, Mourning, Common Ground, and Ruddy Ground-Doves; Greater Roadrunner, Burrowing Owl, Say's Phoebe, Western Kingbird, Loggerhead Shrike, Horned Lark, Mountain and Western Bluebirds, American and Sprague's Pipits, Chipping, Brewer's, Vesper, Lark, Savannah, Lincoln's, and White-crowned Sparrows; Lark Bunting, Red-winged, Yellow-headed, and Brewer's Blackbirds; and Eastern and Western Meadowlarks. Whether your a new or experienced birder, we all have something to contribute to birding. I highly encourage anyone to post their sightings from a good birding area you read about on this guide to the Arizona and New Mexico Birding Listserv, especially the under birded areas which rarely see any birding light. We all can learn different things from one another, so please post your sightings. As most birders are aware, there is an excellent online birding database called eBird. eBird is a listing tool where you may enter your observations and sightings online, which keeps organized lists and records of your observations. Not only is it beneficial for you, but it provides data for other birders and scientists. eBird has become an important tool for productive data and research for birding around the world. Sign up today and enter your sightings, your observations are valuable! There is also AZFO, which stands for Arizona Field Ornithologists. 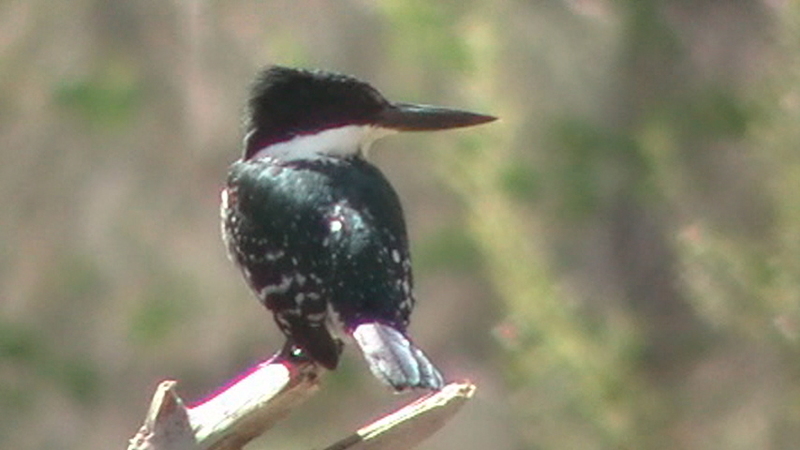 I encourage you to join AZFO, and participate in their field expeditions and bird counts. 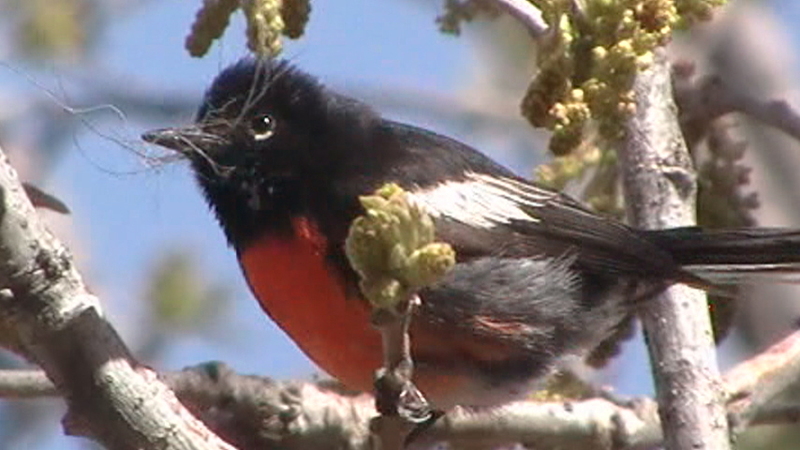 There is a ton of great information on AZFO's website about the birdlife of Arizona, be sure to get involved. If you spot one of the rare birds that is considered rare by the Arizona Bird Committee, then you shall submit a photo to AZFO if you have had opportunities to photograph the bird. Once again, your observations are valuable! For this guide, I encourage you to email me at sunsfan1331@aol.com for several reasons. I would love to hear what you think about this guide or what I could do to make it better. Also, if you have a birding location you know about that is not included on here, feel free to let me know about it and why it should be a hotspot. There are a lot of locations on here, but you know the saying, "the more the better!". If you use this guide and don't want to post publicly on the Internet about it, feel free to email me your sightings. I would love to know what you see!